Sichuan cuisine is known for being spicy, and isn’t known for being particularly kid friendly — with oily, spicy recipes that tend to numb the mouth! 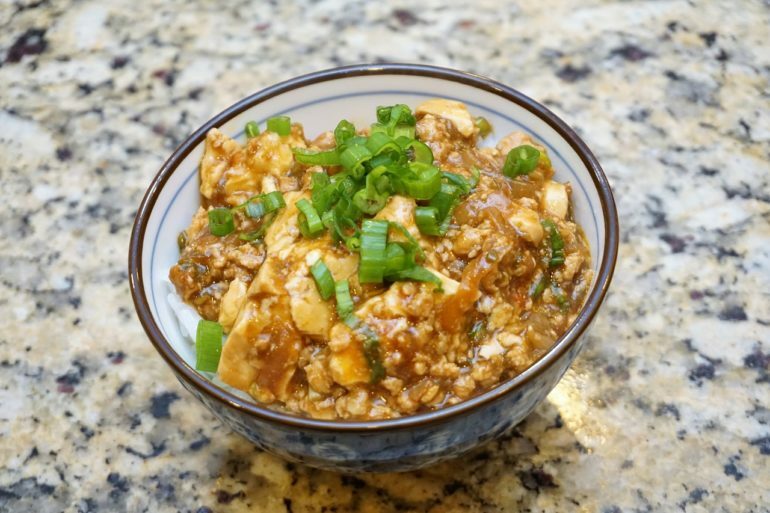 At first blush you wouldn’t think a Sichuan dish like Mapo Tofu would be a family-friendly recipe… but with the right recipe it really can be. The Japanese variant of the dish, is called ‘Mabo Tofu’. (Note: Mabo with a ‘b’, not a ‘p’ as in the Chinese version) This regional recipe adjusts the dish in a way that’s much less oily and spicy than it’s Sichuan origins would indicate. My kids love it! Despite being ‘toned down’, the Japanese inclusion of miso, oyster sauce, and chinese tenmenjan make the dish sweeter, but loaded with umami. We’re finally going to make Japanese Mabo Tofu! I’ve said it before — Every great recipe starts with the sauce. Sure, you can buy sauce packets to save yourself time, but they won’t taste nearly as good as making the sauce by yourself. 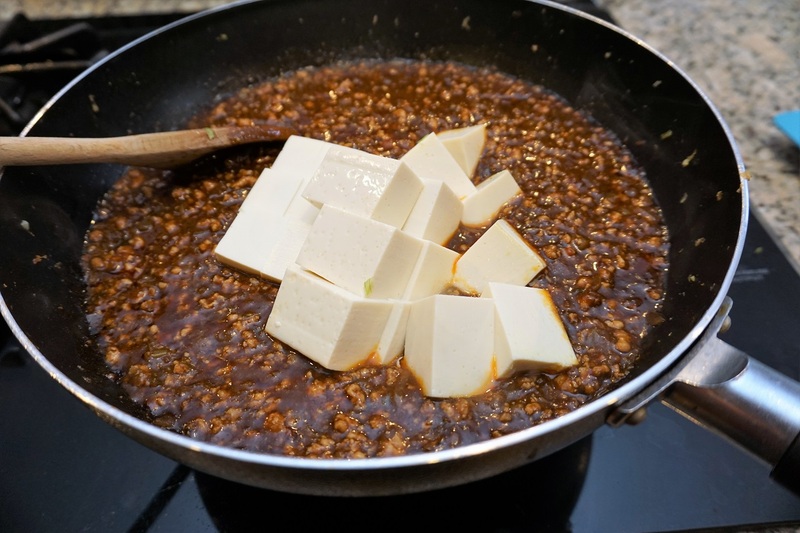 As you would expect, the secret to delicious home-made Mabo Tofu, is making the sauce yourself! You’ll want to mix all the ingredients together using a container that can hold a couple cups worth of liquid. 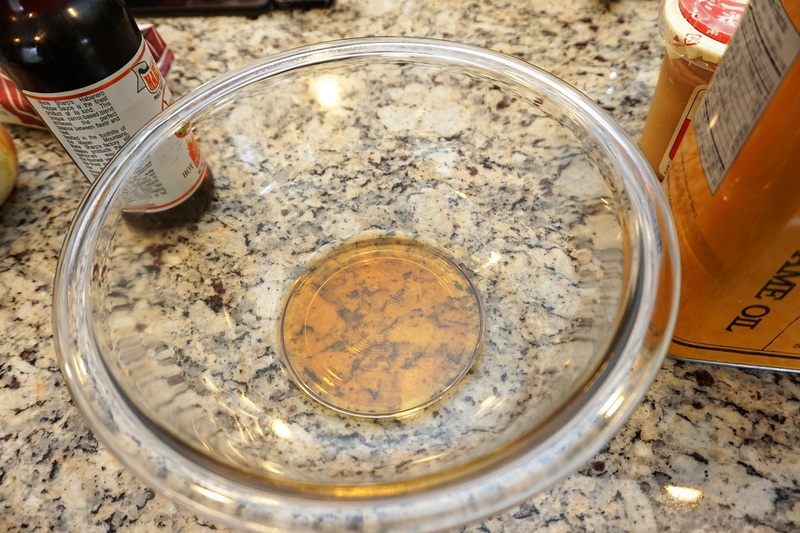 I use a Pyrex glass bowl and typically begin by adding the sesame oil. Many of the ingredients used in this sauce are very common — like sugar, soy sauce and potato starch. 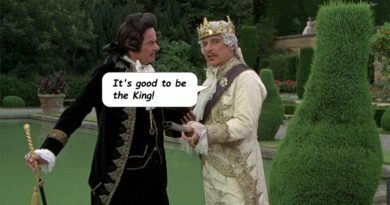 You should have no problem acquiring those. Most people probably have them in the kitchen already. A few of the sauce ingredients however, are slightly unusual. Oyster sauce is the first. 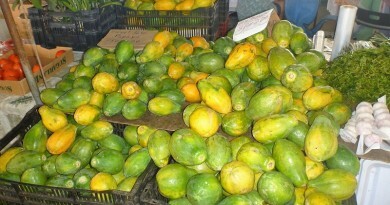 It’s frequently used in Asian cuisines, and can be found at your local asian grocery store. Any brand of oyster sauce will work — I’m using Shirakiku brand here. I’ve also used Dragonfly brand, and Kikoman brand in the past, both of which are perfectly fine and widely available both online and in stores. 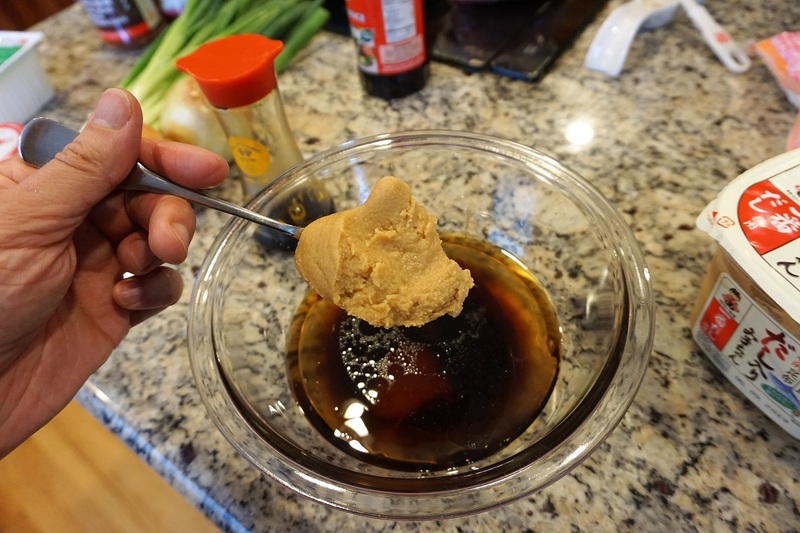 The next usual ingredient is miso paste. If you’ve ever made miso soup at home, you’ve probably encountered tubs of miso paste like this one. I don’t have any particular favorite brand of miso. There’s tons of different brands available. Most are pretty good. Add a healthy 2 tablespoons worth into your sauce bowl, and you’re good to go. Next comes one of the more unusual ingredients – tenmenjan. 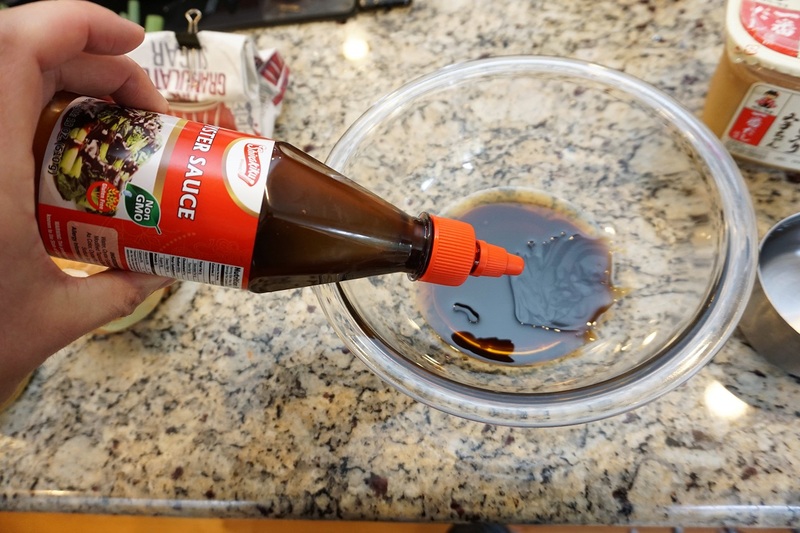 It’s a Chinese sauce also known as “sweet been paste” or “sweet flower sauce”. There are *many* different spellings and names for it. Again, your local asian store should carry some variety of it. Or, you can find it online. 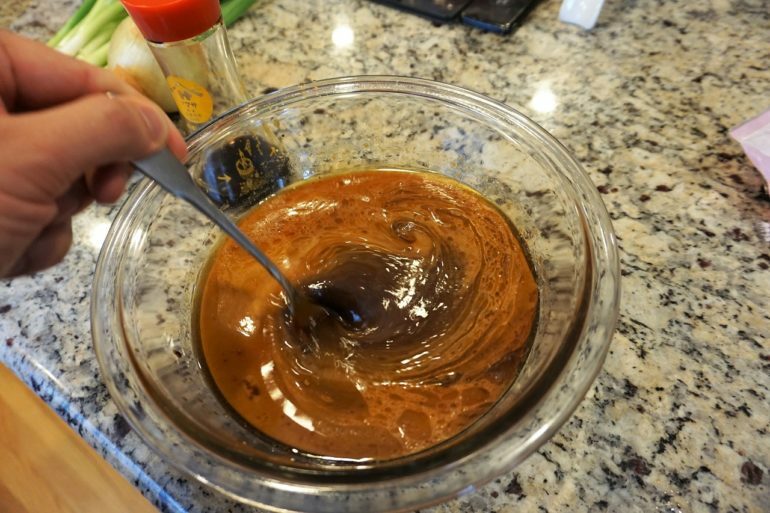 It looks like tar, but tenmenjan imparts a delicious salty-sweet flavor. Add two tablespoons to the sauce mixture. And finally, the last really unusual ingredient is toban djan. Again, this ingredient goes by a number of different names and spellings, but you’ll commonly find it called “chili bean sauce”. I used Lee Kum Kee brand here. It’s not my favorite brand, but it was on-sale last time I needed to stock up at the grocery store. Toban djan is where the spiciness for the dish comes from — add as much as your family can handle. It’s spicy stuff! I typically add about 2 tablespoons worth, but I’ve noticed that different brand’s spiciness level can vary considerably. Experiment to find out how much you like. 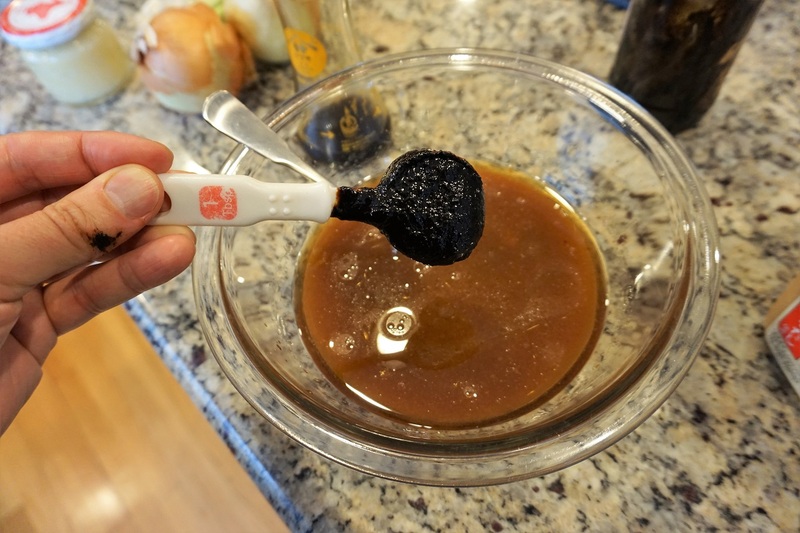 Add the remaining ingredients to the bowl, including the cooking sake, soy sauce, sugar, and potato starch. If you don’t have potato starch around, feel free to substitute with cornstarch. I usually dissolve the starch with a few tablespoons of water first, before adding it to the mabo tofu sauce. 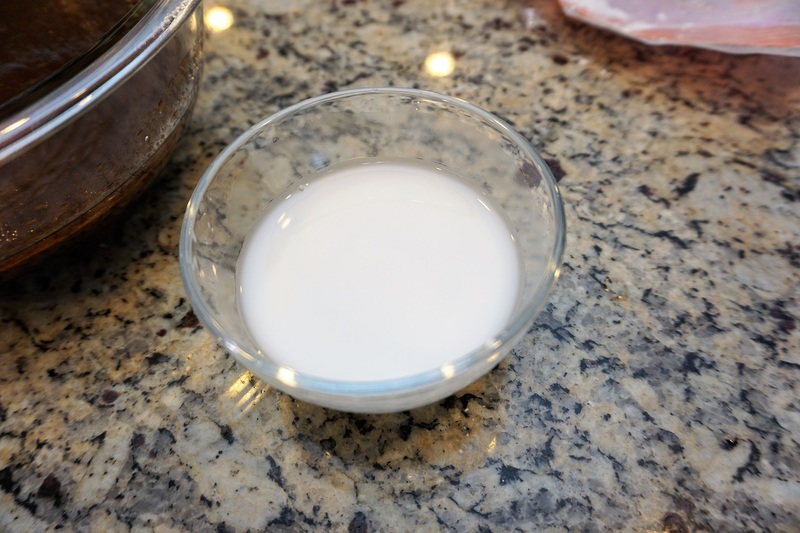 When cooked later, the potato starch will thicken-up the mabo tofu sauce and give it a creamy texture. If you’ve reached this point your sauce should be prepared and at the ready. It’s now time for the main event! There’s nothing terribly unusual about any of the remaining ingredients — it’s all standard stuff. 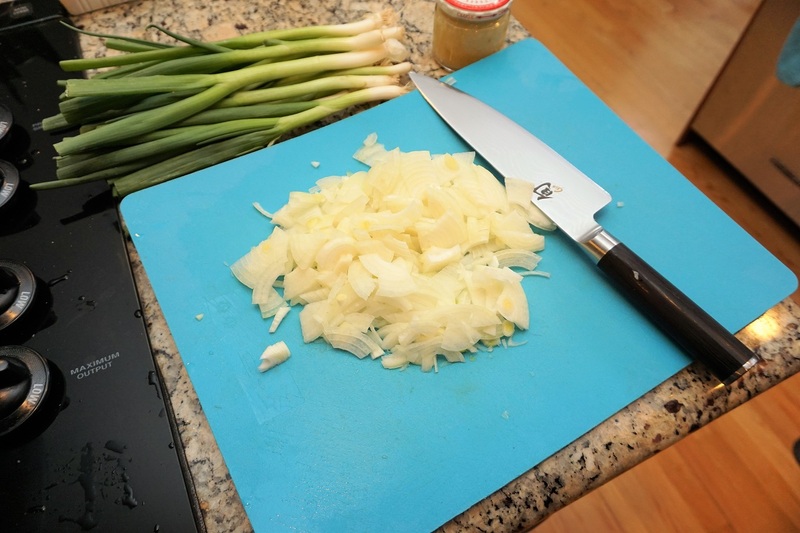 Begin by chopping the large yellow onion into small 1″ slices. 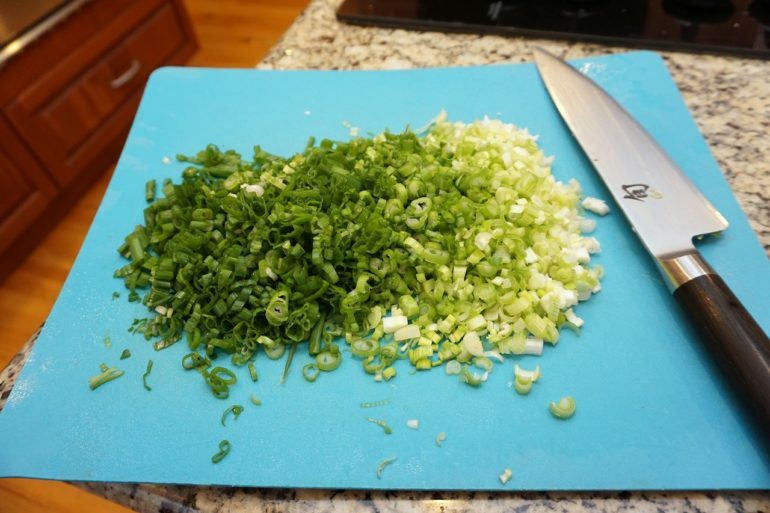 Next, slice the green onions into small slices. 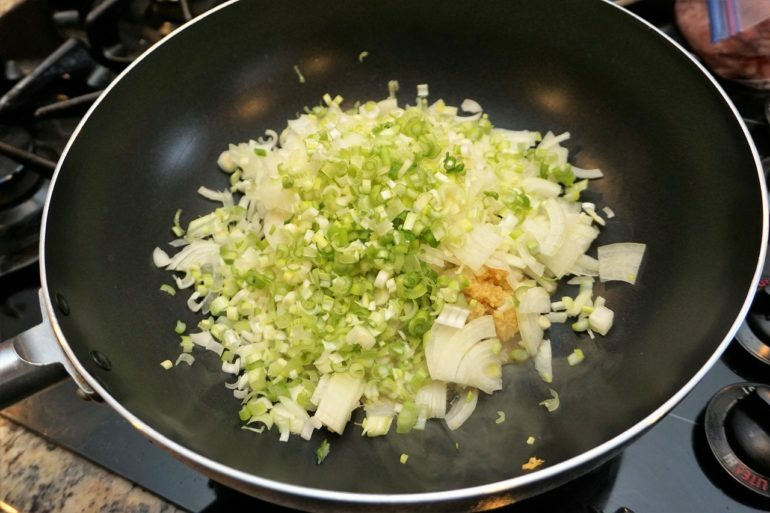 The white parts will be used in the main dish, and the greener ends will be used as a garnish later. Heat a large wok with 1 tablespoon of sesame oil. I usually turn my stove up to ‘high’ and just leave it there. 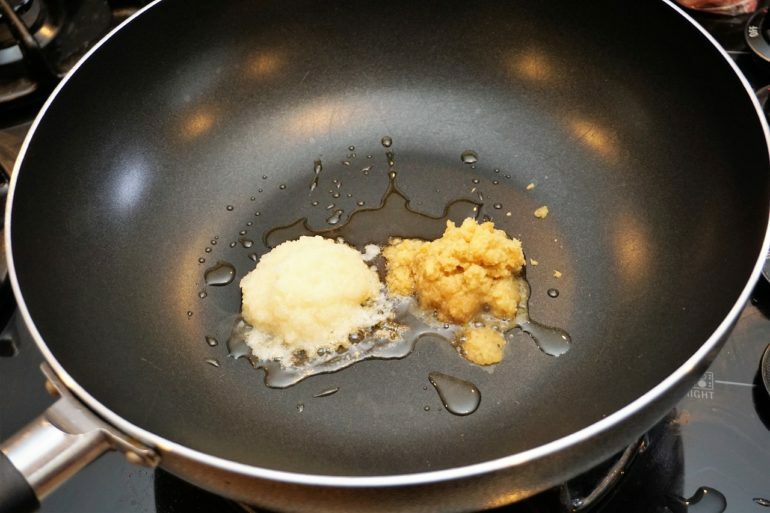 Then add 2 tablespoons each of both minced garlic and minced ginger. 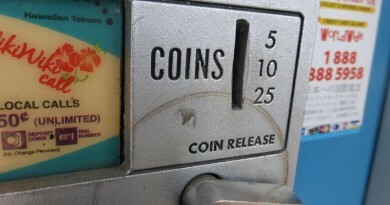 You can either buy these in pre-minced tubes, or make your own like I do. Saute the garlic and ginger, but don’t let it burn. Then add the yellow onion and half of the green onions. I add the white half of the green onions to the wok, and reserve the remaining half for garnish. Cook until most of the liquid is gone from the pan. The onions should just be starting to caramelize. 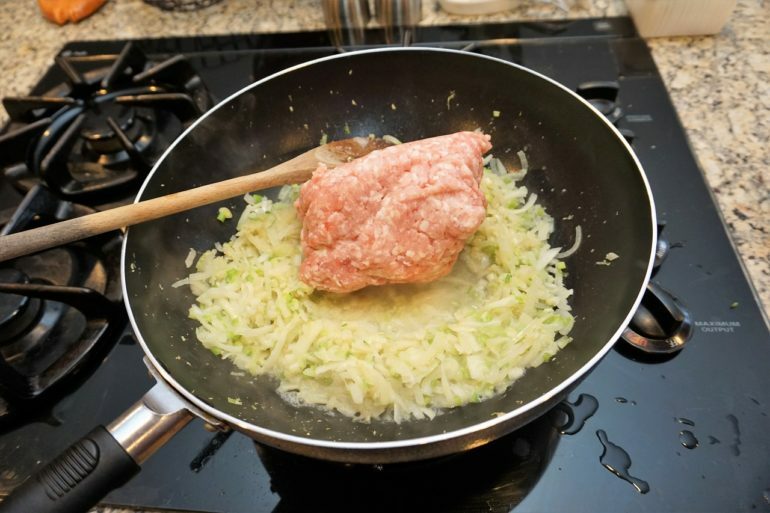 At this point, it’s time to add the ground pork and start cooking it. Again, maintaining a HIGH heat is important here. 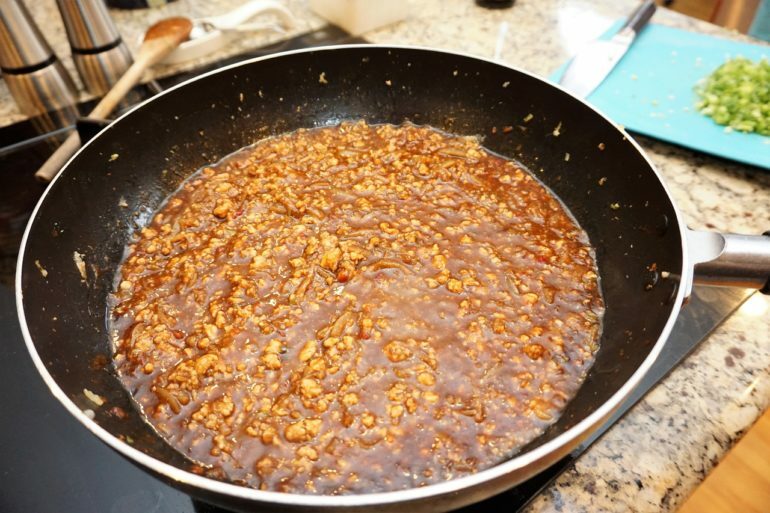 In my opinion, one of the keys to really great mabo tofu is breaking-up that ground pork into really fine pieces when cooking …. so go to town on it with a spoon or spatula. The smaller the better IMHO. You don’t want large chunks. Cook off most of the remaining liquid, but don’t let anything burn. Remember to keep turning the wok contents to keep it from burning. Now, it’s time to add the sauce. Pour it on, and stir it into the pork and onions. At this point, I also reduce the heat to Medium-High. 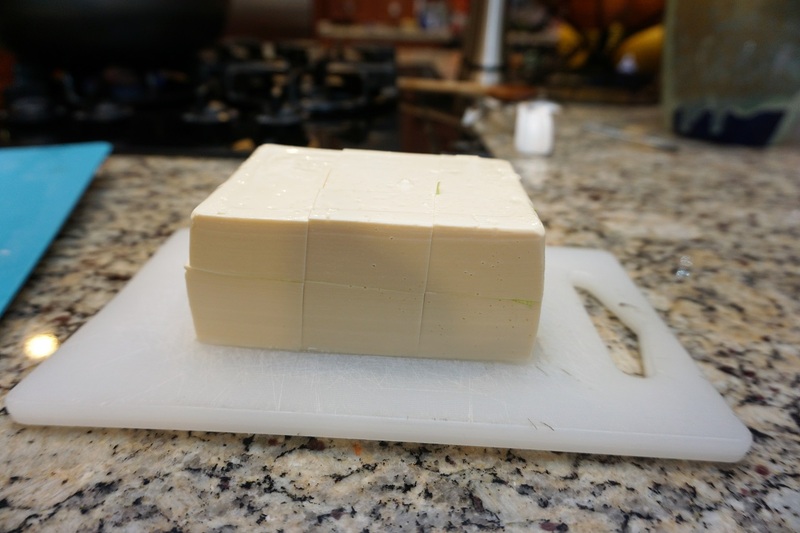 At this point, you can unceremoniously dump the tofu into the sauce/pork mixture and begin mixing. The key here isn’t really to cook the tofu, but mostly to blend and warm it up. Gently mix the two together with a spoon. You can now turn-off the heat and let it cool for a few minutes before serving. Feel free to break-up the tofu a little if the pieces are too large. And you’re done! 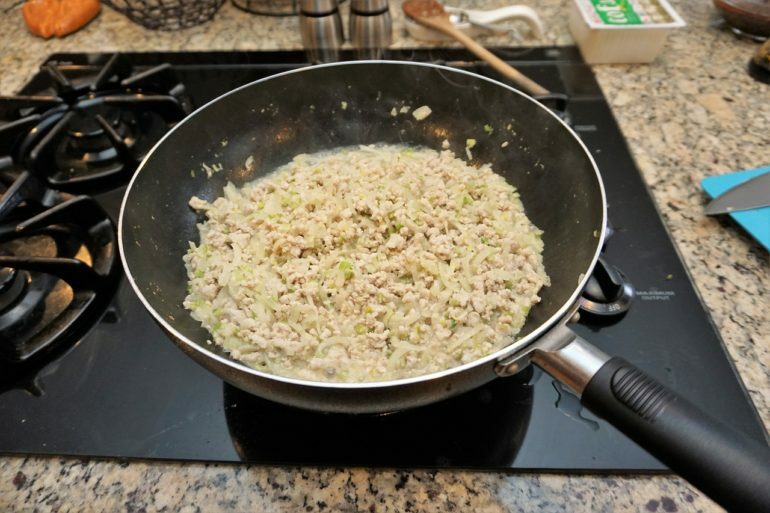 Serve the dish over rice, and garnish with a few of the remaining green onion slices. 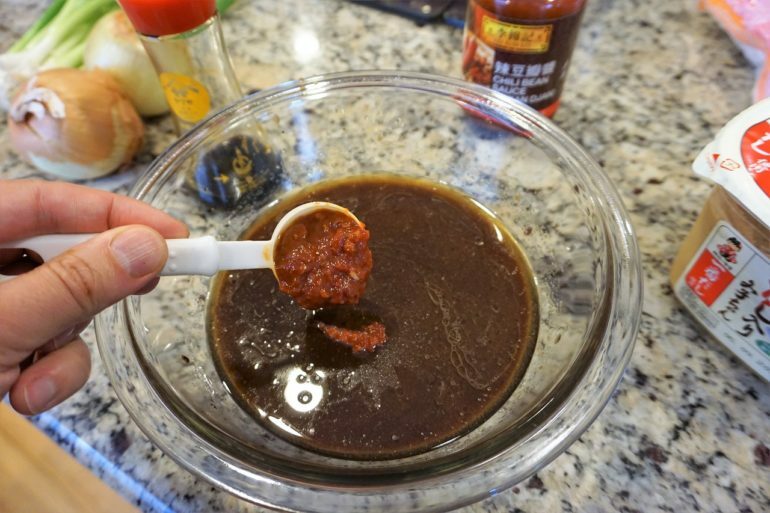 If the adults in your home need an additional ‘spicy kick’ go ahead and separate a portion for adding additional chili-bean sauce (tobanjan), or ground Sichuan peppercorns. And that’s how I make Japanese-style Mabo tofu! I first learned the dish from a relative that lives in Japan, but every family has their own recipe variations. Feel free to adjust the recipe to suit your own family’s tastes. It’s also worth noting this recipe makes quite a bit of food — enough to serve 6-8 adults. For my family of four, we have plenty of leftovers. Enough to make lunches, or to put in the freezer for “easy-dinner nights”. Like most Chinese food, it reheats really well. Cooking time is approximately 45 minutes. That might sound like a lot, but it’s really super simple to make. For a family-pleasing dish, this couldn’t be easier! 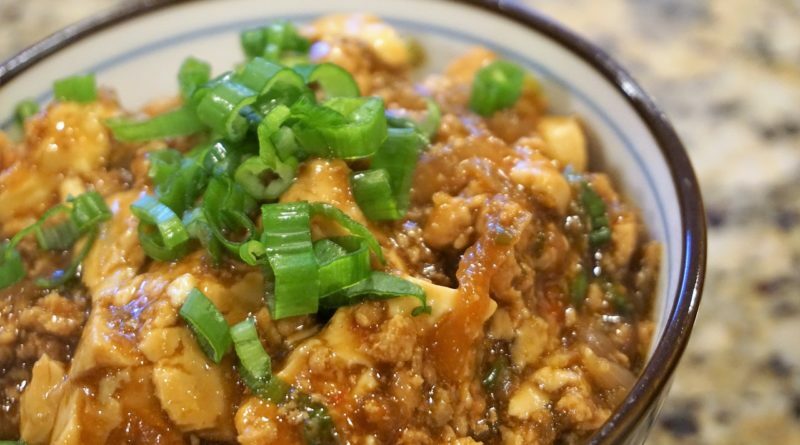 Mabo Tofu is one of my favorites, and I have newfound respect for the missus on the complexities of preparing it (tho she doesn’t always make from scratch….shhhhhh). But with this post in hand I may even give it a try myself – thanks for the recipe. MMMMmmmm, looks good. Can one substitute something for oyster sauce? 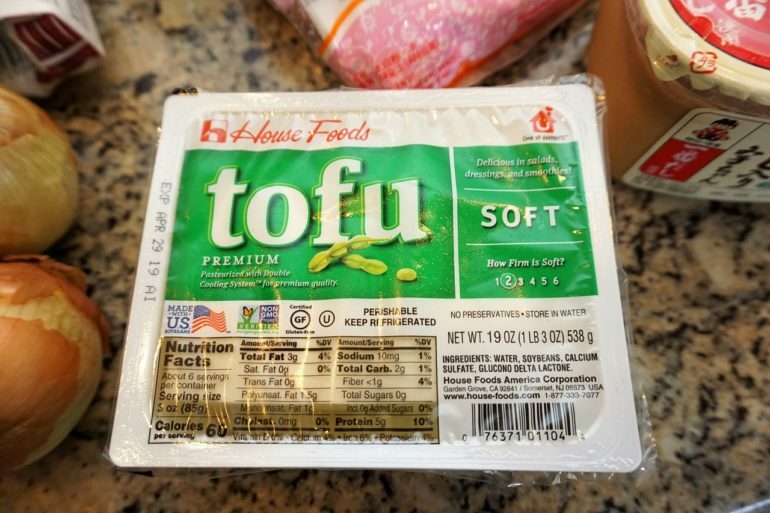 I am allergic and husband is vegetarian, so I also thought just add more tofu instead of pork? What do you think? Mmmmm, I want some! Oh yes, if you’re allergic to oyster sauce then I’d substitute with an equal amount of additional tenmenjan. 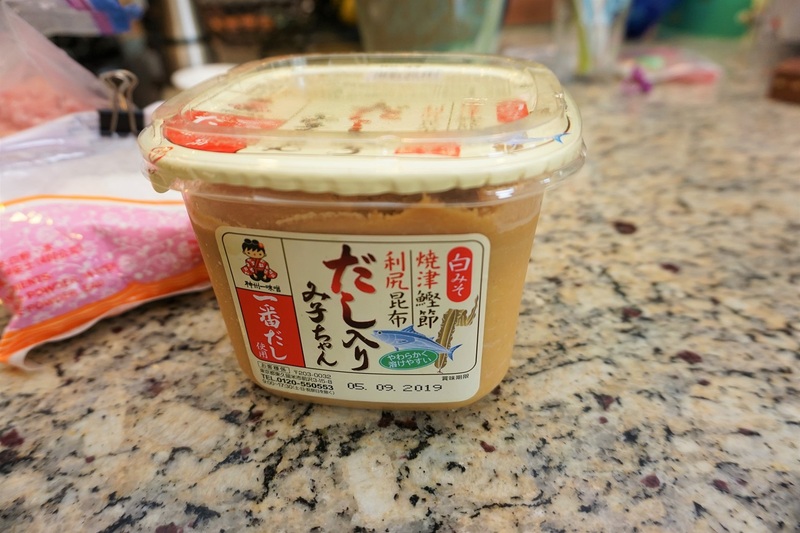 As far as substitutes for pork go — I’ve heard textured soy protein works quite well, but I’ve never tried it. Looks good. I’ll have to try it sometime. Usually, I make the Sichuan version and use very little spicy chili paste. You’re missing Sichuan peppercorn, though. That’s the big difference. You’ll be surprised how much the flavor differs from the Chinese version! I’ve had both varieties, but I can definitely say I prefer the Japanese myself. The umami is off the charts on this one. What’s the issue? I mean, it’s just ground-up soy beans… It’s quite healthy too. I would think it would be right up her alley! That’s quite unfortunate Bob, because there’s TONS of great asian dishes that use tofu. I feel for your suffering! I had been using a couple of different recipes with many of the same ingredients, but it seemed to be lacking in something. It’s probably the Miso, that always adds a lot of flavor. Looks tasty! I have two half-Japanese boys, and the 15-year old loves this dish (as does my American husband), but the 11-year old won’t touch it. 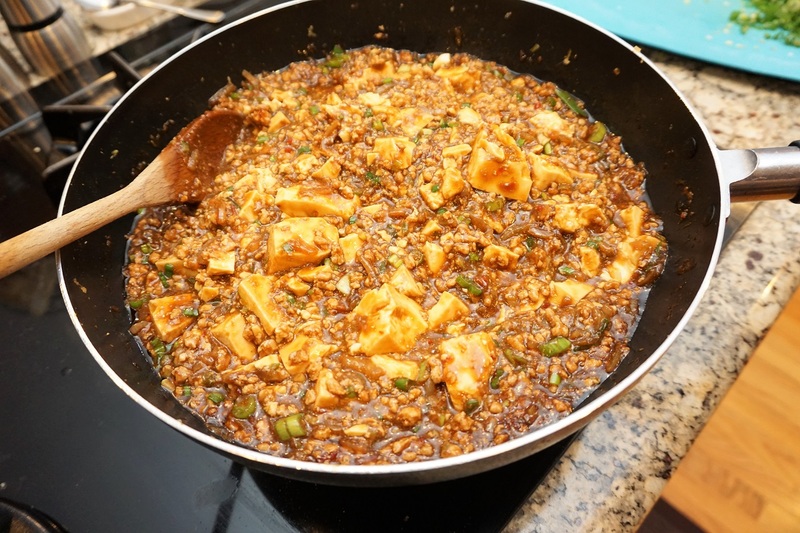 Last summer we went to Chengdu in Sichuan where Mapo tofu is a staple – very spicy but so is everything else there!! Looks delicious! I’m a fan of the Sichuan version and I love cooking. Will definitely try this out! I too am a fan of the Sichuan version but this one looks great as well. Need to pass this recipe to the Mrs. She loves to cook. Do you think that Gochugaru could be use instead of Toban Djan for spice? I cook lots of Koreon foods and would like to minimize the amout of specialty seasoning I keep on hand. I have been a mom for 22 years and have felt that all my kids should eat ‘adult meals’ after being able to eat solid foods. Frankly ‘kids foods’ are expensive for what they are and, not nutrionally dense. Isn’t is fantastic that Seattle is warming up, so nice to not wear a bunch of layers but, I still wear my Mr. Tako approved slippers. If you used gochugaru I think it would definitely taste different. I’m not sure if it would match. 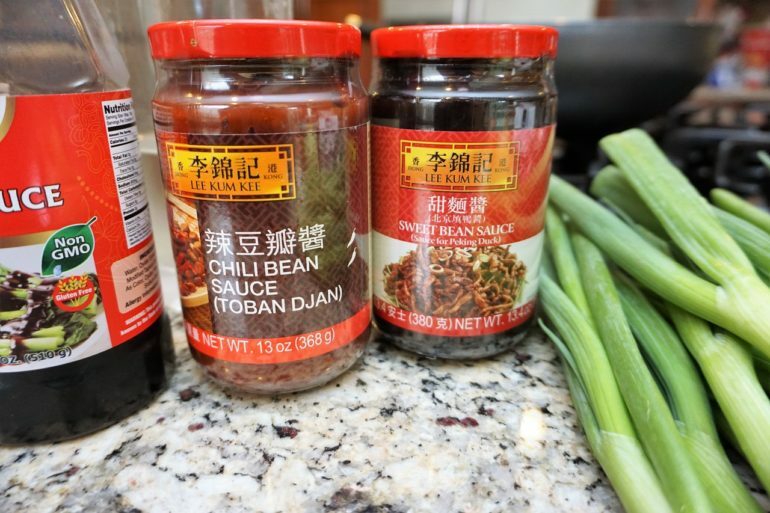 Toban Djan definitely has a specific flavor from the chili’s but it also has a rich flavor from the fermented bean paste that’s in it as well. I suppose you could try using gochugaru, but I would add more miso. Maybe even a red miso, which has a heartier flavor. Hooray, thanks for the recipe! Was looking forward to this. Can’t wait to try it.